« Are They Still Selling The Zune? …cheese, soy beans, corn, pepperoni, mushrooms, mini-hot dogs and hamburger patties, and your choice of ketchup or maple syrup topping. Mighty sickening don’t you think? 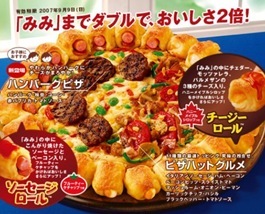 Available in Japanese Pizza Hut’s, the double roll is a whopping 646 calories per slice and packed with fat. Judging by the advert, it doesn’t look much different or fatter than any other Pizza Hut pizzas… And actually, it doesn’t look so bad either. I’d be worried about the taste though and considering what they put on it, it’s fairly safe to say that this may upset one or two Japanese stomachs. This entry was posted on Tuesday, November 13th, 2007 at 6:42 pm	and is filed under Food. You can follow any responses to this entry through the RSS 2.0 feed. You can skip to the end and leave a response. Pinging is currently not allowed.